Really good focus. Someone must have thought there were fish there. Wonderful capture! Those beaks could do some serious damage! Great capture, they are different from the Pelicans I have seen in Australia with that strange protrusion on the upper beak. With all that splashing I'm sure the fish stayed clear or they swam away undetected. That is serious competition for dinner! Excellent shot! You'd think with a "net" as big as they've got on the front of their face, they wouldn't have a problem catching lunch. Great action shot. A right old frenzy going on! Nice shot. Good catch and glad I don't have to try for my dinner in this way!!! Excellent closeup capture of this feeding frenzy. 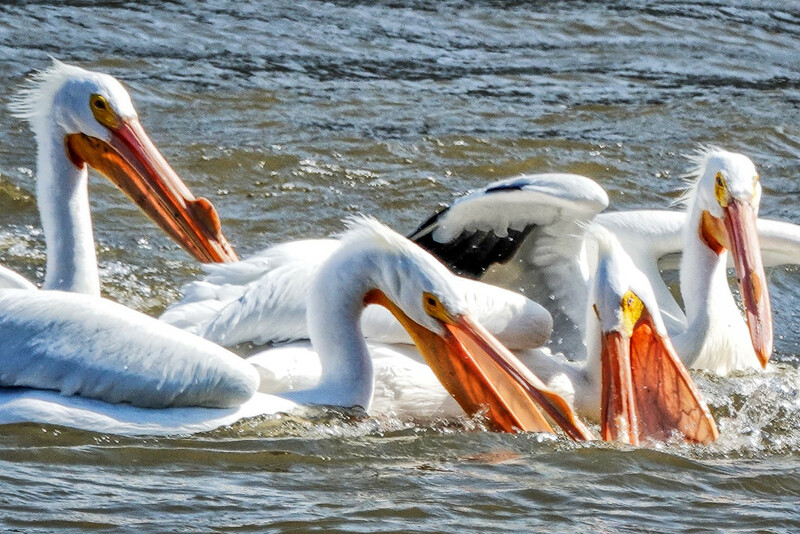 With those huge beaks I expect they got in each others' way and missed all the fish! Fascinating capture, espcially with the one on the right's beak gusset backlit and showing the veins.